Coat a stove-top grill pan or griddle with cooking spray and set over medium-high heat to preheat. 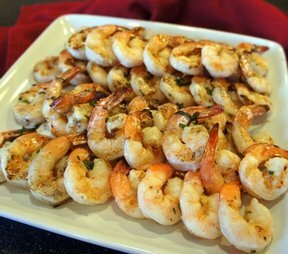 Season both sides of shrimp with salt and black pepper. 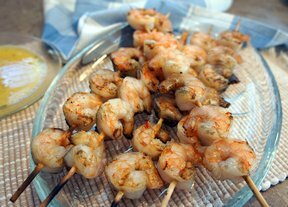 Place shrimp on hot pan and cook 2 to 3 minutes per side, until bright pink and cooked through. 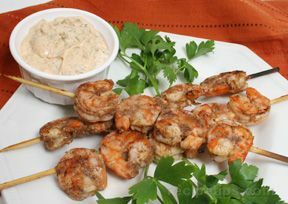 Sprinkle shrimp with cilantro. Meanwhile, in a small saucepan, whisk together orange juice, lime juice, ginger, cornstarch, and garlic. Set pan over medium heat and bring to a simmer. Simmer 2 minutes, until mixture thickens. Season, to taste, with salt and black pepper. Transfer sauce to a serving bowl. Serve 2/3 of the shrimp with the rice and dipping sauce on the side. Reserve remaining shrimp for wraps, if desired.